Holding a gambling licence from the jurisdiction of Curaçao and basing itself out of Costa Rica, My Bookie casino brings forth another online casino that is open to citizens of the United States. It’s another casino that also has a sportsbook platform available alongside, so members are able to utilise both platforms after signing up. This online site has been in operation since the year of 2014, previously having ties to the Bet on Sports brand. The platform itself comes with a very sleek and sophisticated design, which also provides direct links to the sports betting site. Additionally, you’re able to navigate your way through everything with ease and sign up takes just a couple of minutes. 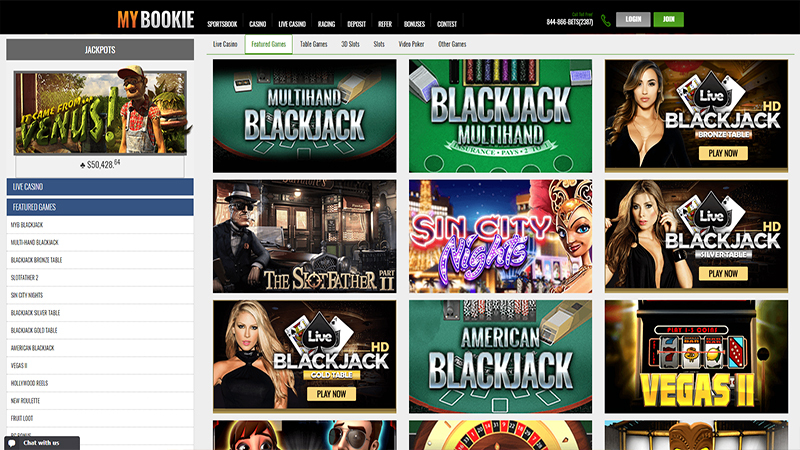 Accessing the game lobby at My Bookie casino will allow you to enjoy games from a small group of online developers. However, Betsoft is the main developer headlining this collection of slots, so you’ll get to access a great selection of titles. As far as the live dealer casino games that My Bookie hosts, these come from the Vivo Gaming company. So again, you’ll get to witness a high quality of live casino games alongside the standard offerings. There’s a great range of slots available to play at My Bookie casino. In fact, it is this category that hosts the biggest collection of games at this US friendly site. Within this section, you’ll get the chance to access games such as Stampede, Kung Fu Cash, Atlantis, Treasure of the Nile and Big Top Circus. Alongside these slots, Betsoft has a range of 3D slot games too, including offerings like The Angler and The Slotfather Part II. On the other hand, if you prefer playing table games, then the My Bookie casino also hosts some of these for you to enjoy. Therefore, you’ll be able to access titles like Blackjack Multihand, Oasis Poker and Top Card Trumps. 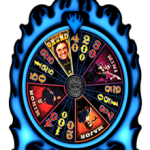 A set of live casino games are also on hand for you to access, as spoken of before. Therefore, you can access various table games within a live casino setting, such as both blackjack and roulette. If you do decide to join the My Bookie casino site, then you get the chance to claim several promotional offers as well. While many of these are available for the sportsbook, there are a few on hand for the casino too. These start with the 150% welcome bonus that you can receive as a newbie. To claim this, you simply need to complete your sign up and then make your first deposit. On top of this, you will be given a bonus of 150% up to $750, which will set you off on a great casino journey with My Bookie casino. Join here. There are one or two other bonuses for regular slot gamers at the casino to receive too, such as the Triple Diamonds 21. This provides you with an additional $500 bonus to play with in the casino if you hit a 21 with three diamond suited cards in any variation of blackjack. Other offers include the chance of Get Paid on the 21st of the Month. This gives you an immediate 8% rebate on your blackjack losses for any variation of the game that you play on the 21st of any month. Make sure that you keep a check on your email inbox too to receive the latest and greatest special offers from the site. As far as the funding of your casino account goes, this is something that you will need to do before you start playing and receiving special offers. Fortunately, there are a few options that you can utilise in this respect. Visa and MasterCard credit and debit cards are accepted, and you can also make use of a Person to Person transfer. Furthermore, My Bookie casino accepts payments via cashier’s checks and bank wire transfers. One last option is to make a deposit by using Bitcoin, if you hold any of these. 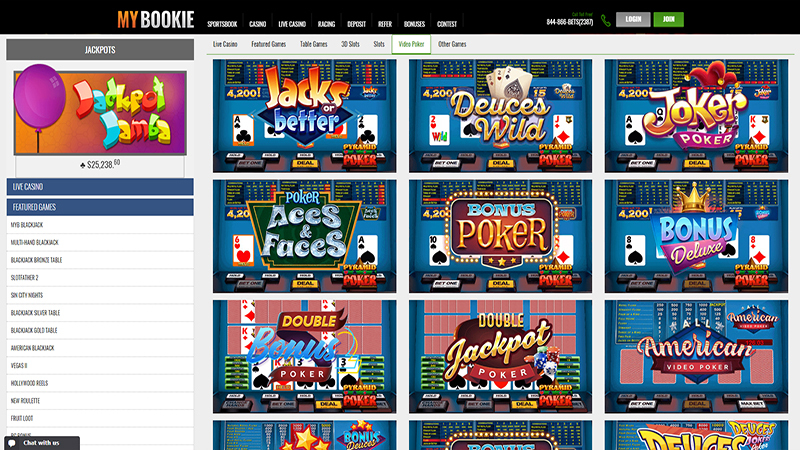 You may also need to seek out some information during your time playing the games at My Bookie casino. In this instance, you can browse your way through a nicely comprehensive FAQ section. Otherwise, you will need to contact the site’s customer support team. They are reachable via email, Live Chat and telephone, with a form being available to fill in for the first of these options. My Bookie casino has a lot of features that will appeal to the masses. It’s got a great choice of casino games to play, a strong selection of promotional offers and a friendly and helpful support team. Additionally, you can utilise a decent set of different banking options, whilst also having a very easy to use website on hand. This is a very good USA friendly online casino. Play at My Bookie Casino and Sportsbook. USA Players Welcome!